The Sikorsky H-34 (company designation S-58) is a piston-engined military helicopter originally designed by American aircraft manufacturer Sikorsky as an anti-submarine warfare (ASW) aircraft for the United States Navy. It has seen extended use when adapted to turbine power by the British licensee as the Westland Wessex and Sikorsky as the later S-58T. H-34s served, mostly as medium transports, on every continent with the armed forces of 25 countries. It saw combat in Algeria, the Dominican Republic, Nicaragua, and throughout Southeast Asia. Other uses included saving flood victims, recovering astronauts, fighting fires, and carrying presidents. It was the last piston-engined helicopter to be operated by the United States Marine Corps, having been replaced by turbine-powered types such as the UH-1 Huey and CH-46 Sea Knight. A total of 2,108 H-34s were manufactured between 1953 and 1970. A U.S. Navy HSS-1 with dipping sonar deployed, in 1960. CH-37C and UH-34D of the United States Marine Corps. The Sikorsky S-58 was developed as a lengthened and more powerful version of the Sikorsky Model S-55, or UH-19 Chickasaw, with a similar nose, but with a tail-dragger rear fuselage and landing gear, rather than the high-tail, 4-post pattern. It retained the nose-mounted radial reciprocating engine with the drive shaft passing through the cockpit placed high above the cargo compartment. The aircraft first flew on 8 March 1954. The first production aircraft was ready in September and entered in service for the United States Navy initially designated HSS-1 Seabat (in its anti-submarine configuration) and HUS-1 Seahorse (in its utility transport configuration) under the U.S. Navy designation system for U.S. Navy, United States Marine Corps (USMC) and United States Coast Guard (USCG) aircraft. The U.S. Army and Marine Corps, respectively, ordered it in 1955 and 1957. Under the United States Army's aircraft designation system, also used by the United States Air Force, the helicopter was designated H-34. The U.S. Army also applied the name Choctaw to the helicopter. In 1962, under the new unified DoD aircraft designation system, the Seabat was redesignated SH-34, the Seahorse as the UH-34, and the Choctaw as the CH-34. Roles included utility transport, anti-submarine warfare, search and rescue, and VIP transport. In its standard configuration, transport versions could carry 12 to 16 troops, or eight stretcher cases if utilized in the MedEvac role, while VIP transports carried significantly fewer people in much greater comfort. A total of 135 H-34s were built in the US and assembled by Sud-Aviation in France, 166 were produced under licence in France by Sud-Aviation for the French Air Force, Navy and Army Aviation (ALAT). The CH-34 was also built and developed under license from 1958 in the United Kingdom by Westland Aircraft as the turboshaft engined Wessex which was used by the Royal Navy and Royal Air Force. The RN Wessex was fitted out with weapons and ASW equipment for use in an antisubmarine role. The RAF used the Wessex, with turboshaft engines, as an air/sea rescue helicopter and as troop transporter. Wessexes were also exported to other countries and produced for civilian use. The helicopters used by the French Army Light Aviation (ALAT), including the Sikorsky H-34, aggregated over 190,000 flying hours in Algeria (over 87,000 for the H-21 alone) and helped to evacuate over 20,000 French combatants from the combat area, including nearly 2,200 at night. By the time the war in Algeria had ended, eight officers and 23 non-commissioned officers from ALAT had been killed. The use of armed helicopters during the Algerian War, coupled with helicopter transports which can insert troops into enemy territory, gave birth to some of the tactics of airmobile warfare that continue today. A U.S. Coast Guard HUS-1G in 1960. French evaluations on the reported ground fire vulnerabilities of the CH-34 may have influenced the U.S. Army's decision to deploy the CH-21 Shawnee to Vietnam instead of the CH-34, pending the introduction into widespread service of the Bell UH-1 Iroquois. U.S. Army H-34s did not participate in Vietnam, and did not fly in the assault helicopter role, but a quantity were supplied to the Army of the Republic of Vietnam. These saw little use due to a lack of spare parts and maintenance. U.S. Marine Corps UH-34Ds over Mekong Delta. U.S. Marine Corps UH-34Ds over Vietnam, 1965. Its higher availability and reliability due to its simplicity compared to the newer helicopters led Marines to ask for it by name. The phrases "give me a HUS", "get me a HUS" and "cut me a HUS" entered the U.S. Marine Corps vernacular, being used even after the type was no longer in use to mean "help me out". USMC H-34s were also among the first helicopter gunships trialled in theatre, being fitted with the Temporary Kit-1 (TK-1), comprising two M60C machine guns and two 19-shot 2.75 inch rocket pods. The operations were met with mixed enthusiasm, and the armed H-34s, known as "Stingers" were quickly phased out. The TK-1 kit would form the basis of the TK-2 kit used on the UH-1E helicopters of the USMC. An H-34 was featured in the famous early-Vietnam War Time-Life photo essay "One Ride With Yankee Papa 13", photographer Larry Burrows, which depicted stages of a disastrous combat mission in which several crew were wounded or killed. 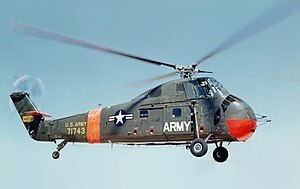 The H-34 remained in service with United States Army and Marine Corps aviation units into the late 1960s; at this time it was also standard equipment in Marine Corps Reserve, Army Reserve and Army National Guard aviation units, eventually being replaced by the UH-1 Iroquois utility helicopter. Sikorsky terminated all production activities in 1968, a total of 1,821 having been built. 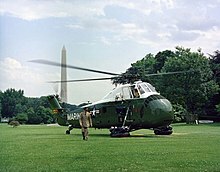 All H-34 helicopters were retired from service in the U.S. military by the early 1970s; the type having the distinction of being the last piston-engined helicopter to be operated by the Marine Corps. On 3 September 1973, the last flight of a USMC UH-34 occurred as Bureau Number 147191 which had been formally assigned to Headquarters Squadron, FMF Pacific was flown from Quantico, Virginia to MCAS New River to be placed on static display. France purchased an initial batch of 134 Choctaws; these were shipped in kit-form from the United States and locally assembled by Sud-Aviation. Later, a further 166 were domestically manufactured by Sud-Aviation; these were operated by the French Army Light Aviation (Army), French Naval Aviation (Navy) and Air force. The Wessex was used as an anti-submarine and utility helicopter with the Royal Navy and as a transport and search and rescue helicopter with the Royal Air Force. VNAF CH-34As at Tan Son Nhut. Used by 219th South Vietnamese Air Force Squadron to insert MACV-SOG reconnaissance teams into Laos. The H-34 was the primary VNAF helicopter until replaced by the Bell UH-1 Huey. Israeli S-58s flew numerous combat missions after the end of the Six-Day War; these missions were mainly against Palestinians infiltrating Israel or against their bases in Jordan. On 21 March 1968, various S-58s participated in the Battle of Karameh, bringing Israeli troops in and out of the theatre as well as evacuating the wounded. This was the last operation of the S-58 as it was retired shortly later, having been replaced by the newer Bell 205 and Aérospatiale Super Frelon. The H-34's lift capacity was just sufficient to lift a Mercury space capsule. In 1961, the hatch of Mercury-Redstone 4 was prematurely detached and the capsule was filled with seawater. The extra weight was too much for the H-34 and the capsule, Liberty Bell 7, was emergency released and sank in deep water, remaining on the ocean floor until 1999. In the late 1980s and early 1990s, S-58T turbine-powered helicopters were operated by New York Helicopters in scheduled passenger airline service between JFK International Airport and East 34th Street Heliport, New York. U.S. Army version of the HSS-1 powered by a 1,525 hp R-1820-84, re-designated CH-34A in 1962, 359 built and 21 transferred from the U.S. Navy. Designation for H-34A used for weapon tests. Staff transport conversions of H-34A. H-34As converted with detail changes, became CH-34B in 1962. H-34B design with detail changes converted from H-34As, became CH-34C in 1962. 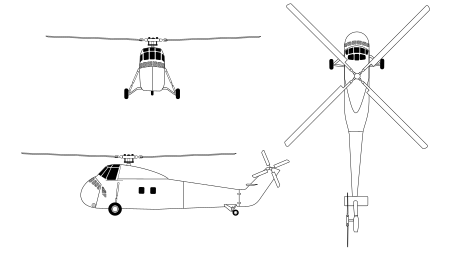 Designation for CH-34C used for weapon tests. Staff transport conversions of CH-34C. Designation applied to aircraft given USAF serials to be transferred under MAP and MDAP. HUS-1 re-designated in 1962 and 54 new build. SH-34J without ASW equipment for cargo and training purposes. Staff transport conversions of SH-34J. Three Sikorsky S-58s for evaluation by the U.S. Navy, re-designated YHSS-1 then YSH-34G in 1962. One HSS-1 re-engined with two YT-58-GE as a flying test bed, re-designated SH-34H in 1962. One HSS-1 converted as the HSS-1N prototype, re-designated YSH-34J in 1962. Night/Bad weather version of the HSS-1 with improved avionics and autopilot, re-designated SH-34J in 1962, 167 built (an addition 75 HSS-1 airframes were built to CH-34C standard for West Germany). Forty HUS-1s fitted with amphibious pontoons, re-designated UH-34E in 1962. 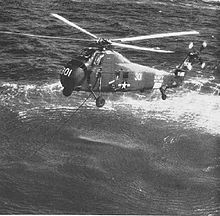 United States Coast Guard version of the HUS-1, re-designated HH-34F in 1962, six built. Four HUS-1s converted for Antarctic operations with VXE-6, re-designated LH-34D in 1962. Seven HUS-1s fitted with VIP interior for the Executive Flight Detachment, re-designated VH-34D in 1962. Canadian military designation for the S-58B. An S-58T performing an external load operation in Dallas, Texas. Certified in 1972 an increased maximum weight variant of the S-58B. Certified in 1972 an increased maximum weight variant of the S-58C. Certified in 1972 an increased maximum weight variant of the S-58D. RV conversion by Winnebago Industries and Orlando Helicopter, fitted with a Wright Cyclone R-1820-24 engine. Commercial conversion. 18-seat passenger transport helicopter. Licence production and development in the United Kingdom. 27 July 1960 Chicago Helicopter Airways Flight 698 a S-58C registered N879 crashed into Forest Home Cemetery, Forest Park, Illinois, United States with the loss of 11 passengers and two crew. The investigation concluded that the helicopter became uncontrollable as a result of structural disintegration in flight caused by a fatigue failure of the main rotor blade. 13 March 2011 Sikorsky S-58ET, N33602, suffered an engine failure, descended and veered off the side of an office building in El Segundo, California, while lifting an external air conditioning unit from the roof. The commercial pilot was seriously injured, the helicopter was substantially damaged and consumed by a post-impact fire. The helicopter was registered to Heli Flight, Inc., and operated by Aris Helicopters. Naval 52 – SH-34J on static display at Viña del Mar Airport in Viña del Mar, Valparaíso. This airframe was the second of two received by the Chilean Navy and was exhibited for the first time after restoration at Exponaval 2014. It was previously on display at Alberto Widmer High School. HSS-1, No. 182, is on display at the Base d'aéronautique navale d'Hyères, the military part of the Toulon–Hyères Airport in France. Serving until 1977 with 31F squadron, it was one of the last operational H-34's in French Naval Aviation. Now restored, No. 182 is displayed in the typical navy blue color of the French navy's helicopters of this time period. 80+73 – SH-34G on static display at the Deutsches Museum in Munich, Bavaria. 81+09 – H-34 GIII on static display at the Hubschraubermuseum Bückeburg in Bückeburg, Lower Saxony. 58-0356 – S-58C on static display at the Auto & Technik Museum Sinsheim in Sinsheim, Baden-Württemberg. A former Royal Netherlands Navy SH-34J Seabat bearing the markings of number 134 operating from Valkenburg naval air station is on display with folded rotor blades and tail in the newly opened "Nationaal Militair Museum" situated at the former airbase of Soesterberg. Previously the aircraft was displayed in the National Air Force museum at Kamp Zeist which has since closed down. H4k-64/30 – Type 4A on static display at the Royal Thai Air Force Museum in Bangkok, Bangkok. Unknown ID – Type 4 on static display at the Royal Thai Air Force Museum in Bangkok, Bangkok. 153131 – UH-34D on static display at the Philippines Air Force Aerospace Museum in Manila, National Capital. 138460 – UH-34D on static display at the Evergreen Aviation & Space Museum in McMinnville, Oregon. 143937 – UH-34D on static display at the Estrella Warbirds Museum in Paso Robles, California. 143939 – H-34A on static display at the USS Midway Museum in San Diego, California. 145694 – UH-34J on static display at the Wings of Freedom Aviation Museum in Horsham, Pennsylvania. This airframe was built in October 1958 and restored in April 1995. 145717 – LH-34D on static display at the New England Air Museum in Windsor Locks, Connecticut. 147171 – UH-34D on static display in the Vietnam display next to USS Yorktown at the Patriots Point Naval & Maritime Museum in Charleston, South Carolina. 147191 – VH-34D is on static display at the New River Aviation Memorial at the front gate of Marine Corps Air Station New River in Jacksonville, North Carolina. This airframe was the last flying US Marine Corps H-34 in 1973. 148002 – SH-34J on static display at the Pueblo Weisbrod Aircraft Museum in Pueblo, Colorado. 148764 – UH-34D on static display at Fort Worth NAS near Fort Worth, Texas. 148768 – UH-34D on static display at the Udvar-Hazy Center of the National Air and Space Museum in Chantilly, Virginia. 148963 – HH-34J on static display at the Pacific Aviation Museum in Honolulu, Hawaii. 150213 – UH-34D on static display at the Cavanaugh Flight Museum in Addison, Texas. 150219 – UH-34D on static display at the Flying Leatherneck Aviation Museum in San Diego, California. 150227 – UH-34D on static display at the National Museum of Naval Aviation in Pensacola, Florida. 150255 – UH-34D on static display at the Wings and Rotors Air Museum in Murrieta, California. 150553 – UH-34D on static display at the USS Hornet Museum in Alameda, California. This airframe entered service in August 1963 and was donated to the museum in 2003 by the Pima Air and Space Museum. 150570 – UH-34D on static display at the National Museum of the Marine Corps in Triangle, Virginia. 154895 – UH-34D on static display at the Palm Springs Air Museum in Palm Springs, California. 53-4477 – CH-34G on static display at the Air Force Flight Test Center Museum in Edwards, California. 53-4526 – CH-34A in storage at the United States Army Aviation Museum near Daleville, Alabama. 53-4544 – CH-34C on static display at the Camp San Luis Obispo Museum and Historical Site in San Luis Obispo, California. 54-0914 – CH-34C on static display at the Russell Military Museum in Zion, Illinois. 55-4496 – CH-34C in storage at the Carolinas Aviation Museum in Charlotte, North Carolina. This airframe was previously on display at the Florence Air & Missile Museum in Florence, South Carolina. 56-4320 – VH-34C on static display at the United States Army Aviation Museum near Daleville, Alabama. 57-1684 – VH-34C on static display at the Pima Air and Space Museum in Tucson, Arizona. 57-1698 – CH-34A on static display at the Allegheny Arms & Armor Museum in Smethport, Pennsylvania. This airframe was previously on display at the Intrepid Sea, Air & Space Museum in New York, New York. 57-1705 – CH-34C on static display at Travis AFB near Fairfield, California. 57-1708 – CH-34C on static display at the Pacific Coast Air Museum in Santa Rosa, California. 57-1725 – VH-34C on static display at the U.S. Army Transportation Museum near Newport News, Virginia. ^ a b c d e "S58 (CH-34, UH-34, VH-34, SH-34, HH-34, S-58A, C, D, S-58T)." Sikorsky Product History. Retrieved: 5 March 2013. ^ "H-34." Warplanes.net. Retrieved: 30 December 2010. ^ Mesko 1984, pp. 4–6. ^ Fails 1995, p. 9. ^ Endres, Günter G. Jane's Helicopter Markets and Systems. Coulsdon, Surrey, UK: Jane's Information Group, 1996. ISBN 978-0-7106-1363-9. ^ Fails 1995, p. 127. ^ MARINES AND HELICOPTERS, 1962–1973, pp.127–128, retrieved 9 December 2014. ^ "Sikorsky H-34 / CH-34 Choctaw."militaryfactory.com. Retrieved: 17 January 2011. ^ The Vietnamese Air Force, 1951–1975. An Analysis of Its Role in Combat and Fourteen Hours at Koh Tang. Volume 3, USAF Southeast Asia monograph series 4 and 5. Washington D.C.: Office of Air Force History, 1985. ^ Gunston 1982, p. 92. ^ Wade, Mark. "Mercury MR-4." astronautix.com, 29 April 2009. Retrieved (from archive): 26 July 2011. ^ Brown, Allan. "S-58ET from New York Helicopter." airliners.net. Retrieved: 17 January 2011. ^ "H-58." Fuerza Aerea Argentina. Retrieved: 7 March 2013. ^ "World Air Forces 1968, p. 48." flightglobal.com. Retrieved: 1 March 2013. ^ a b c d "World Air Forces 1968, p. 49." flightglobal.com. Retrieved: 1 March 2013. ^ "SH-34J." Armada de Chile. Retrieved: 7 March 2013. ^ "Sikorsky-HSS-1N-(S-58A)." Demand media. Retrieved: 7 March 2013. ^ "World's Air Forces 1981, p. 332. flightglobal.com. Retrieved: 7 March 2013. ^ a b c d "World Air Forces 1968, p. 51." flightglobal.com. Retrieved: 1 March 2013. ^ "World Air Forces 1971, p. 928." flightglobal.com. Retrieved: 7 March 2013. ^ "World's Air Forces 1981, p. 346." flightglobal.com. Retrieved: 7 March 2013. ^ "World's Air Forces 2004, p. 65." flightglobal.com. Retrieved: 7 March 2013. ^ "World Air Forces 1968, p. 52." flightglobal.com. Retrieved: 7 March 2013. ^ "World Air Forces 1968, p. 52 (m)." flightglobal.com. Retrieved: 1 March 2013. ^ "=World Air Forces 1971, p. 932." flightglobal.com. Retrieved: 7 March 2013. ^ "World Air Forces 1968, p. 53." flightglobal.com. Retrieved: 1 March 2013. ^ "World Air Forces 1968, p. 54." flightglobal.com. Retrieved: 1 March 2013. ^ "World's Air forces 1981, p. 362." flightglobal.com. Retrieved: 7 March 2013. ^ "Sikorsky H-34 / CH-34 Choctaw - Transport / Close-Support Helicopter - History, Specs and Pictures - Military Aircraft." Militaryfactory.com. Retrieved: 20 January 2014. ^ "World Air Forces 1968, p. 60."flightglobal.com. Retrieved: 1 March 2013. ^ "World's Air Forces 1981, p. 377." flightglobal.com. Retrieved: 7 March 2013. ^ "World Air Forces 1968, p. 55." flightglobal.com. Retrieved: 7 March 2013. 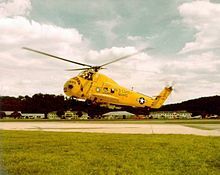 ^ "Air America: Sikorsky UH-34s (1st series)." utdallas.edu. Retrieved: 10 August 2014. ^ "US Air Force H-34." Helicopter History Site. Retrieved: 7 March 2013. ^ "USCG HH-34.' USCG History. Retrieved: 7 March 2013. ^ "World's Air Forces 1987, p. 104." flightglobal.com. Retrieved: 7 March 2013. ^ "CAA 429 World Airline Accident Summary with reference to Civil Aeronautics Board Aircraft Accident Report SA-357." United Kingdom CAA Document. ^ "NTSB Identification: WPR11FA163." ntsb.gov. Retrieved: 26 July 2011. ^ Romero, Álvaro (8 December 2014). "Presentaron al Sikorsky SH-34J Seabat Naval 52". ModoCharlie (in Spanish). ModoCharlie. Retrieved 29 October 2016. ^ Romero, Álvaro (August 2008). "Ilustre desconocido v3.0". ModoCharlie (in Spanish). ModoCharlie. Retrieved 29 October 2016. ^ "Le Sikorsky de Palyvestre." Avions-légendaire.net, 29 July 2012. Retrieved: 22 August 2014. Retrieved: 13 March 2015. ^ "Les Sikorsky H-34 et HSS-1." Les hélicoptères anciens en France, 22 August 2014. Retrieved: 13 March 2015. ^ "Sikorsky S-58 (H-34 G)". Deutsches Museum. Retrieved 29 October 2016. ^ "Airframe Dossier - SikorskyS-58 / H-34 / HSS / Wessex, s/n 80+73 Marineflieger, c/n 58-1557". Aerial Visuals. AerialVisuals.ca. Retrieved 29 October 2016. ^ "Sikorsky S-58 (H-34 GIII)". Das Hubschraubermuseum Buckeburg. Retrieved 29 October 2016. ^ "Airframe Dossier - SikorskyS-58 / H-34 / HSS / Wessex, s/n 81+09 Heeresfliegertruppe, c/n 58-1679". Aerial Visuals. AerialVisuals.ca. Retrieved 29 October 2016. ^ "Airframe Dossier - Sikorsky S-58C, s/n B-11 FABe, c/n 58-0356, c/r D-HAUF". Aerial Visuals. AerialVisuals.ca. Retrieved 29 October 2016. ^ a b "Building 5:Helicopters and last propeller fighter". Royal Thai Air Force Museum. Archived from the original on 26 October 2013. Retrieved 29 October 2016. ^ "Airframe Dossier - SikorskyS-58 / H-34 / HSS / Wessex, s/n H4k-64/30 RTAF, c/n 58-1117, c/r N1170U". Aerial Visuals. AerialVisuals.ca. Retrieved 29 October 2016. ^ "Airframe Dossier - Sikorsky UH-34D Seahorse, c/n 58-1683". Aerial Visuals. AerialVisuals.ca. ^ "Airframe Dossier - Sikorsky UH-34D Seahorse, s/n 153131 USN, c/n 58-1769". Aerial Visuals. AerialVisuals.ca. Retrieved 8 November 2016. ^ "Helicopters". Evergreen Museum Campus. Evergreen Museum. Retrieved 29 October 2016. ^ "Airframe Dossier - SikorskyS-58 / H-34 / HSS / Wessex, s/n 138460 USN". Aerial Visuals. AerialVisuals.ca. Retrieved 29 October 2016. ^ "Sikorsky UH-34D Choctaw". Estrella Warbirds Museum. Retrieved 21 May 2018. ^ "Airframe Dossier - Sikorsky UH-34J Seabat, s/n 143937 USN, c/n 58-0707, c/r N85128". Aerial Visuals. AerialVisuals.ca. Retrieved 21 May 2018. ^ "H-34 Seabat". USS Midway Museum. USS Midway. Archived from the original on 29 October 2016. Retrieved 29 October 2016. ^ "Airframe Dossier - Sikorsky H-34A Choctaw, s/n 143939 USN, c/n 58-0709". Aerial Visuals. AerialVisuals.ca. Retrieved 29 October 2016. ^ "SIKORSKY UH-34D "SEA BAT"". Harold F. Pitcairn Wings of Freedom Aviation Museum. Wings of Freedom Aviation Museum. Retrieved 28 October 2016. ^ "Airframe Dossier - Sikorsky SH-34J Seabat, s/n 145694 USN, c/r N46920". Aerial Visuals. AerialVisuals.ca. Retrieved 28 October 2016. ^ "Sikorsky LH-34D (S-58) 'Seabat'". New England Air Museum. New England Air Museum. Archived from the original on 29 August 2016. Retrieved 29 October 2016. ^ "UH-34D SEAHORSE" (PDF). Patriots Point. Patriots Point. Retrieved 28 October 2016. ^ "Airframe Dossier - Sikorsky UH-34D Seahorse, s/n 147171 USN, c/n 58-1087". Aerial Visuals. AerialVisuals.ca. Retrieved 29 October 2016. ^ Burns, Sarah (1 August 2013). 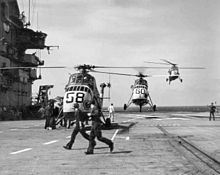 "Squadron restores pre-Vietnam helicopters". JDNews.com. Jacksonville, North Carolina: GateHouse Media, LLC. Retrieved 28 October 2016. ^ "c/n 58-1142". helis.com. Retrieved 28 October 2016. ^ "SH-34J Sea Horse." Archived 2016-12-25 at the Wayback Machine Pueblo Weisbrod Aircraft Museum. Retrieved: 13 March 2015. ^ "Airframe Dossier - SikorskyS-58 / H-34 / HSS / Wessex, s/n 148002 USN". Aerial Visuals. AerialVisuals.ca. Retrieved 28 October 2016. ^ "Airframe Dossier - Sikorsky S-58 / H-34 / HSS / Wessex, s/n 148764 USMC, c/n 58-1315". Aerial Visuals. AerialVisuals.ca. Retrieved 29 October 2016. ^ "Sikorsky UH-34D Seahorse". Smithsonian National Air and Space Museum. Archived from the original on 10 May 2015. Retrieved 29 October 2016. ^ Panko, Ray (26 August 2013). "Sikorsky H-34 Choctaw/Seabat/Seahorse". Pacific Aviation Museum Pearl Harbor. Retrieved 28 October 2016. ^ "Aircraft". Cavanaugh Flight Museum. Archived from the original on 29 October 2016. Retrieved 29 October 2016. ^ "Airframe Dossier - SikorskyS-58 / H-34 / HSS / Wessex, s/n 150213 USN". Aerial Visuals. AerialVisuals.ca. Retrieved 29 October 2016. ^ "Aircraft Listing" (PDF). Flying Leathernecks. Flying Leatherneck Historical Foundation. Retrieved 29 October 2016. ^ "Airframe Dossier - Sikorsky UH-34D Seahorse, s/n 150219 USN, c/n 58-1559". Aerial Visuals. AerialVisuals.ca. Retrieved 29 October 2016. ^ "H-34 SEABAT/SEAHORSE". National Naval Aviation Museum. Naval Aviation Museum Foundation. Retrieved 28 October 2016. ^ O'Connell, Jim. "Pete VX-6." Radiocom.net. Retrieved: 4 September 2012. ^ "SIKORSKY UH-34D". Wings & Rotors Air Museum. Archived from the original on 13 November 2016. Retrieved 5 December 2016. ^ "Airframe Dossier - Sikorsky UH-34D Seahorse, s/n 150255 USMC". Aerial Visuals. AerialVisuals.ca. Retrieved 5 December 2016. ^ "Sikorsky UH-34D". Platinum Fighter Sales. Archived from the original on 15 December 2016. Retrieved 5 December 2016. ^ "UH-34D Seahorse". USS Hornet Sea, Air & Space Museum. USS Hornet. Archived from the original on 29 October 2016. Retrieved 28 October 2016. ^ Kristy, Ben. "Sikorsky UH-34D". National Museum of the Marine Corps. National Museum of the Marine Corps. Retrieved 29 October 2016. ^ "Airframe Dossier - Sikorsky UH-34D Seahorse, s/n 150570 USN, c/n 58-1699, c/r N19YN". Aerial Visuals. AerialVisuals.ca. Retrieved 29 October 2016. ^ "Aircraft". Palm Springs Air Museum. Palm Springs Air Museum. Retrieved 29 October 2016. ^ "Airframe Dossier - Sikorsky UH-34D Seahorse, s/n 154895 USMC, c/n 58-1805". Aerial Visuals. AerialVisuals.ca. Retrieved 29 October 2016. ^ "Aircraft Inventory". Flight Test Historical Foundation. Flight Test Historical Foundation. Archived from the original on 19 October 2016. Retrieved 29 October 2016. ^ "Airframe Dossier - Sikorsky S-58 / H-34 / HSS / Wessex, s/n 57-1726 USAF". Aerial Visuals. AerialVisuals.ca. Retrieved 29 October 2016. ^ "Airframe Dossier - Sikorsky CH-34A, s/n 53-4526 US, c/n 58-0088". Aerial Visuals. AerialVisuals.ca. Retrieved 29 October 2016. ^ "CH-34 "Choctaw"". The California Military Museum. Retrieved 29 October 2016. ^ "Airframe Dossier - SikorskyS-58 / H-34 / HSS / Wessex, s/n 53-4544 USAF, c/n 58-0106". Aerial Visuals. AerialVisuals.ca. Retrieved 29 October 2016. ^ "RUSSELL MILITARY MUSEUM EXHIBITS". Russell Military Museum. Russell Military Museum. Retrieved 29 October 2016. ^ "Airframe Dossier - Sikorsky CH-34C Choctaw, s/n 54-0914 US, c/n 58-0194". Aerial Visuals. AerialVisuals.ca. Retrieved 29 October 2016. ^ "Helicopters". Carolinas Aviation Museum. Carolinas Aviation Museum. Archived from the original on 25 July 2011. Retrieved 28 October 2016. ^ "Airframe Dossier - Sikorsky CH-34A, s/n 55-4496 US, c/n 58-0509". Aerial Visuals. AerialVisuals.ca. Retrieved 28 October 2016. ^ "c/n 58-509". helis.com. Retrieved 28 October 2016. ^ "Rotary Wing". United States Army Aviation Museum. Army Aviation Museum Foundation, Inc. Archived from the original on 5 November 2016. Retrieved 29 October 2016. ^ "Airframe Dossier - Sikorsky VH-34C, s/n 56-4320 US, c/n 58-718". Aerial Visuals. AerialVisuals.ca. Retrieved 29 October 2016. ^ "Choctaw." Pimaair.org. Retrieved: 13 March 2015. ^ "Airframe Dossier - Sikorsky CH-34A, s/n 57-1698 USAF, c/n 58-0842, c/r N94485". Aerial Visuals. AerialVisuals.ca. Retrieved 29 October 2016. ^ "Airframe Dossier - Sikorsky CH-34C Choctaw, s/n 57-1705 US". Aerial Visuals. AerialVisuals.ca. Retrieved 29 October 2016. ^ "H-34 Choctaw Helicopter". Pacific Coast Air Museum. Pacific Coast Air Museum. Archived from the original on 21 October 2016. Retrieved 29 October 2016. ^ "Airframe Dossier - SikorskyS-58 / H-34 / HSS / Wessex, s/n 57-1708 USAF, c/n 58-0868". Aerial Visuals. AerialVisuals.ca. Retrieved 29 October 2016. ^ "THE EXECUTIVE FLIGHT DETACHMENT". US Army Transportation Museum. Archived from the original on 26 October 2016. Retrieved 29 October 2016. ^ "Airframe Dossier - Sikorsky VH-34C, s/n 57-1725 US, c/n 58-0910". Aerial Visuals. AerialVisuals.ca. Retrieved 29 October 2016. ^ Apostolo 1984, p. 84. Duke, R.A. Helicopter Operations in Algeria [Translated French]. Washington, DC: Dept. of the Army, 1959. Fails, William R. Marines & Helicopters, 1962–1973. Darby, Pennsylvania: Diane Publishing, 1995. ISBN 0-7881-1818-8. Griffin, John A. Canadian Military Aircraft Serials & Photographs 1920–1968. Ottawa, Ontario, Canada: Queen's Printer, Publication No. 69-2, 1969. Gunston, Bill. An Illustrated Guide To the Israeli Air Force. London: Salamander Books, 1982. ISBN 978-0-668-05506-2. Leuliette, Pierre. St. Michael and the Dragon: Memoirs of a Paratrooper, New York: Houghton Mifflin, 1964. Mesko, Jim: Airmobile: The Helicopter War in Vietnam. Carollton, Texas: Squadron/Signal Publications, 1984. ISBN 0-89747-159-8. Riley, David. "French Helicopter Operations in Algeria." Marine Corps Gazette, February 1958, pp. 21–26. Shrader, Charles R. The First Helicopter War: Logistics and Mobility in Algeria, 1954–1962. Westport, Connecticut: Praeger Publishers, 1999. ISBN 0-275-96388-8. Spenser, Jay P. Whirlybirds: A History of the U.S. Helicopter Pioneers. Seattle, Washington: University of Washington Press, 1998. ISBN 0-295-97699-3. Padin, Núñez, Jorge Felix and Juan Carlos Cicalesi, eds. Sikorsky S-55/H-19 & S-58/T (Serie en Argentina) in Spanish. Bahía Blanca, Argentina: Fuerzas Aeronavales, 2011. ISBN 978-987-1682-13-3. 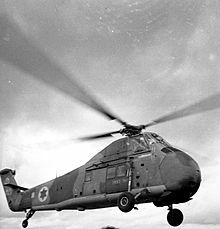 Wikimedia Commons has media related to Sikorsky S-58 and Sikorsky H-34. This page was last edited on 20 April 2019, at 08:21 (UTC).